Let's face it, lessons from the book of Revelation can be difficult to teach at any level — but are especially difficult to teach to children. Fortunately, age-appropriate children's church bulletins about All Saints Day that don't overcomplicate the lessons from Revelation are now available from Children's Worship Bulletins. 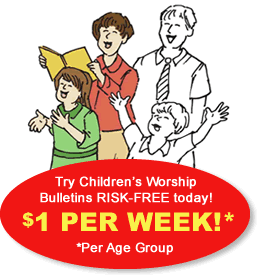 Children's Worship Bulletins make it easy to create fun and biblically based activities to teach critical lessons from Revelation. In this short article, we will show you how to use two of our children's church bulletins about All Saints Day to create engaging activities for children ages 3-12. These examples are perfect for Sunday school or any other church event in which you want to teach age-appropriate lessons about All Saints Day. Give each child a bulletin and a pencil and have them complete the puzzle, "They all shouted ..."
After everyone has completed the puzzle, read aloud Revelation 7:9-17. Explain the activity, "Today, we're going to memorize Revelation 7:10, which is the answer to the puzzle in your bulletin: 'Salvation belongs to our God.' Let's say our verse together, along with the reference: 'Salvation belongs to our God. —Revelation 7:10'"
Give everyone a bulletin and pencil and have them solve the puzzle "John said he heard the angels in heaven worshiping God and saying ..."
After everyone has completed the puzzle, have a helper distribute a length of cord or yarn and a set of nine strips of cardstock to everyone. Place the colored pencils in the center of the workspace for everyone to share. Explain the activity, "To help us remember how the angels worship God, we're going to make our own code necklaces. You'll encode each strip of card stock with one line from our puzzle. Onto the front of the first strip, copy the symbols that spell 'Amen.' Then, onto the back, write the word 'Amen!'" Continue, "Continue with the next strip. Onto the front of the strip, copy the symbols that spell 'Praise' and 'Glory'. Be sure to add the 'and' between the two sets of symbols. Onto the back, write the words 'Praise and Glory.'" Continue, "Continue making strips, copying the symbols for each line onto the front of the strip and writing the words onto the back, until you've finished all nine strips." Continue, "Then, string your strips, in order, onto your cord/yarn, and tie the ends together in a knot to create your code necklace." While everyone works on their code necklaces, read aloud Revelation 7:9-17 to reinforce the lesson.